Today we’re introducing a new series on the Chopped Podcast. The series is called Blog Talk and today specifically is this: Blog Talk: Republish Old Content. 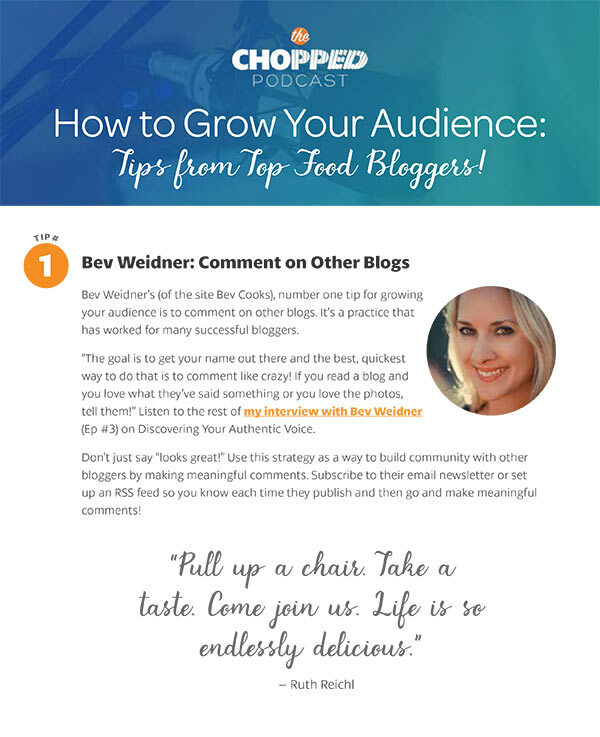 The goal of Blog Talk is to answer your behind-the-scenes questions of the business of food blogging. Read below for more information on today’s episode. If you’re into the business of blogging, you should check out my post on the Three Revenue Models for Food Bloggers or my interview with Casey of Kitchen-Play on the Business of Blogging. 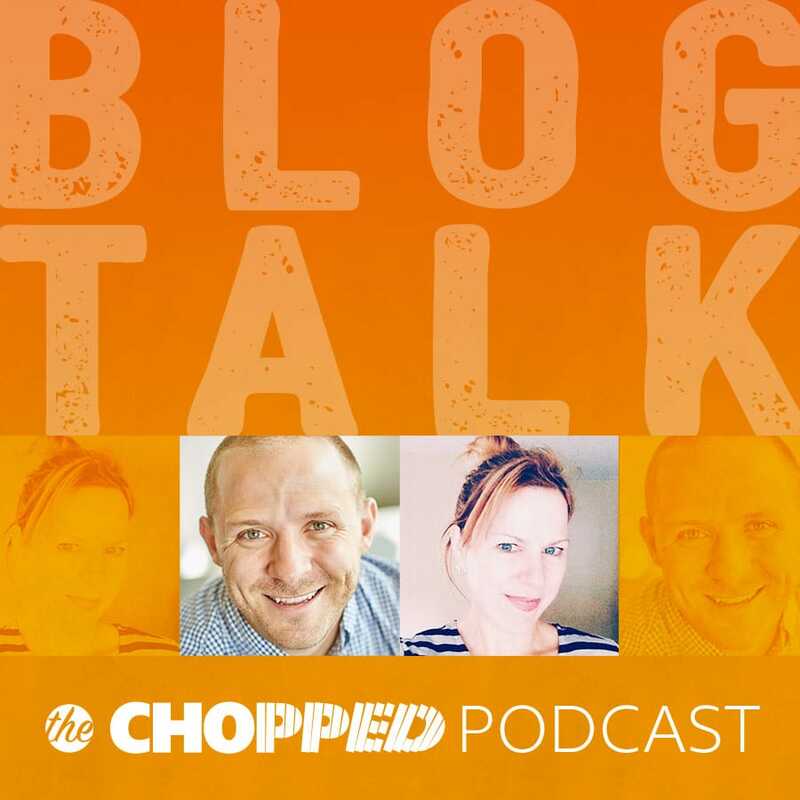 This week Marly introduces Blog Talk, a new series on the Chopped Podcast. And she’s got a co-host for Blog Talks. Trevor and I will be talking about your questions on food blogging. You know, the behind-the-scenes kind of questions. The questions you’d love to ask but just don’t know who to ask. Or the questions that you’re worried will sound stupid. Rule #1 of Blog Talk: There are no stupid questions in Blog Talk. Our goal at ChoppedCon is to help you be your best. We hope this Blog Talk: Republish Old Content episode is helpful to the important work you’re doing every day! Now, go forth and Be Your Best You! The first question: I’d love to know more about updating old content. What happens on Pinterest if I remove a photo or replace it with a new one? Question number two: Should I do posts for product or only if I get paid? Third question: What should I make sure is in a sponsored post contract? Fourth question: I’ve been blogging for awhile, how much should I continue to post? Fifth/Sixth question: How many posts should I create before I make my blog public? and How do I add a ‘coming soon’ page to my blog before I launch? Learn about future Chopped Podcast episodes and get some awesome tips on food blogging by subscribing to the ChoppedCon newsletter. Just add your email in the subscribe section at the bottom of this page. You’ll be glad you did! Want to suggest a topic for our next episode? Send an email to Marly. Thanks so much for listening to today’s podcast. I hope you found it informative and helpful to the work you do every day. Make sure you don’t miss out on any of the Chopped Podcast episodes by heading on over to iTunes to subscribe to the Chopped Podcast. While you’re there, provide a review and rating is a great way to help other podcast listeners find it too! That’s it for today’s podcast. As always, thanks so much for joining in the discussion! Ready to Grow Your Audience? Subscribe and get The Chopped Academy Guide, "Grow Your Audience" as well as updates on The Chopped Podcast, events, courses and more! Hey Marly, Congrats on 100! And thank you for taking the time to create such a valuable podcast. I wanted to add a comment note about the sponsored content topic. It seems like so many blog-related podcasts discuss the idea of working with brands through a blog to generate relationships/partnerships and full-time income. This has been such a popular model these days. But it’s not always necessary, in my opinion. I know, from my own site and friendships with other bloggers, that it’s 100% possible to build a full-time (as far being an income generator) site without working with brands via a blog. There are so many ways to generate income on a blog. I hope that’s encouraging for someone that doesn’t want to do brand/sponsorship work, but also wants to blog full-time. Congrats, again, on the 100th episode. I love listening to your podcasts :).